The arc of a circle is a portion of the circumference of a circle. In a plane, an angle whose vertex is the center of a circle is a central angle of the circle. 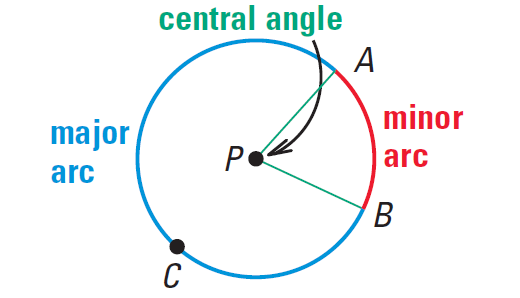 If the measure of a central angle, ∠APB is less than 180°, then A and B and the points of circle ⊙P shown below in the interior of ∠APB form a minor arc of the circle. The points A and B and the points of the circle ⊙P in the exterior of ∠APB form a major arc of the circle. If the end points of an arc are the end points of a diameter, then the arc is a semicircle. Arcs are named by their end points. For example, the minor arc associated with ∠APB above is AB. 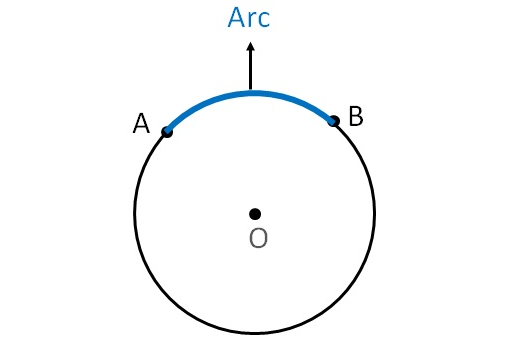 Major arcs and semicircles are named by their endpoints and by a point on the arc. For example, the major arc associated with ∠APB above is ACB. 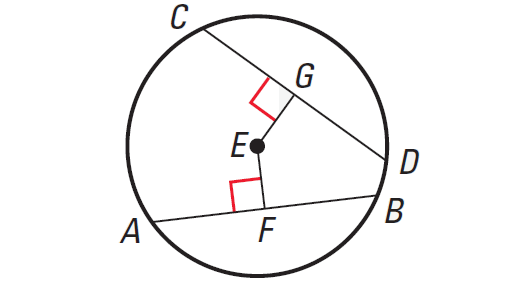 EGF below is a semicircle. The measure of a minor arc is defined to be the measure of its central angle. We can write the measure of an arc next to the arc. The measure of a semicircle is 180°. The measure of a major arc is defined as the difference between 360° and the measure of its associated minor arc. 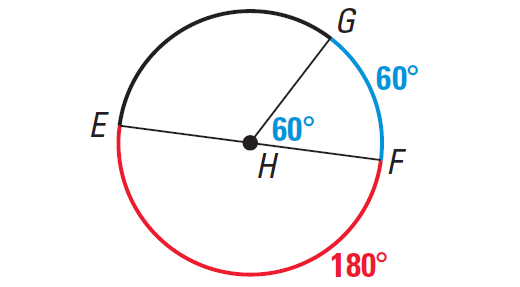 The measure of a whole circle is 360°. In the same circle or in congruent circles, two minor arcs are congruent, if and only if their corresponding chords are congruent. 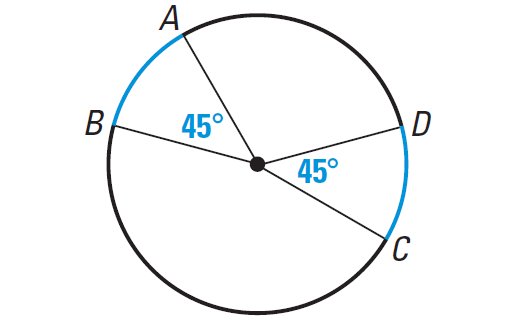 If a diameter of a circle is perpendicular to a chord, then the diameter bisects the chord and its arc. If one chord is perpendicular bisector of another chord, then the first chord is a diameter. In the diagram shown above, chord JK is a perpendicular bisector of the chord ML. So, chord JK is a diameter of the circle. In the same circle or in congruent circles, two chords are are congruent, if and only if they are equidistant from the center. Find the measure of arc MPN of ⊙R. Two arcs of the same circle or of congruent circles are congruent arcs, if they have the same measure. So, two minor arcs of the same circle or of congruent circles are congruent if their central angles are congruent. It has been illustrated in the following examples. Find the measures of the blue arcs in the diagram shown below. Are they congruent ? Arcs AB and DC are in the same circle. 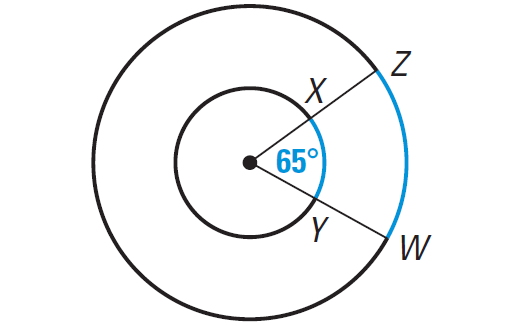 m∠arc XY = m∠arc ZW = 65°, but arc XY and arc ZW are not arcs of the same circle or of congruent circles. So, arc XY and arc ZW are not congruent. 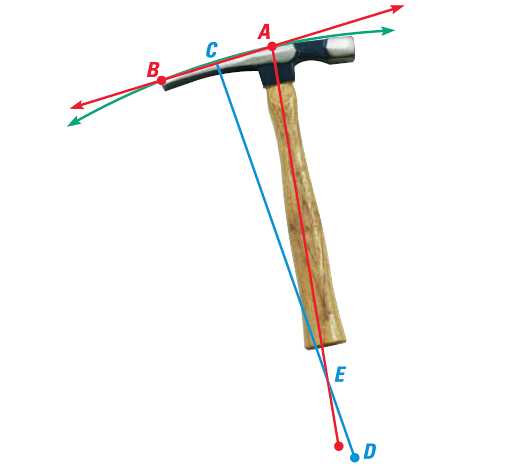 A masonry hammer has a hammer on one end and a curved pick on the other end. The pick works best, if we swing it along a circular curve that matches the shape of the pick. Find the center of the circular swing. Draw a segment AB, from the top of the masonry hammer to the end of the pick as shown in the diagram below. Find the midpoint C, and draw a perpendicular bisector CD. Find the intersection of CD with the line formed by the handle. The point of intersection of CD with the line formed by the handle is the center of the swing. So, the center of the swing lies at E.
After having gone through the stuff given above, we hope that the students would have understood, "Arcs and Chords".